Now that I’ve recovered from my post-Thanksgiving daze, I have a confession to make: I did absolutely nothing for Thanksgiving. And I loved every minute of it. I am becoming a fan of tossing tradition into the fireplace and cozying up while it burns bright. I’m not anti-social or anti-holiday. I had invitations for Thanksgiving, but I was perfectly happy staying in my PJs all day, reading, napping, watching movies. I had chicken pot pie and pumpkin pie. Heaven. After working on Friday, I did much the same for the rest of the weekend. Had my family stayed in town this year, I would have joined them for dinner. But it was a delicious indulgence to do what everyone else wasn’t. Christmas is evolving in similar ways. When my parents died a few years ago, the Christmas Eve tradition of our family gathering was passed on to me — which I was thrilled about. My sister and I agreed we’d create new traditions. Last year we hit on the perfect plan: brunch with coffee, lox and bagels and mimosas. Perfect for our Protestant/Buddhist family. I keep my mother’s tradition of serving plum pudding with hard sauce alive by making gingerbread cupcakes topped with hard sauce (basically buttercream frosting with brandy). No one really liked the plum pudding much anyway. Maybe that tradition will evolve over time, as will my longstanding dislike of going out on New Year’s Eve unless it’s something I’d enjoy doing any other night of the year. I’ve hosted New Year’s Day Hair-of-the-Dog parties and will probably do so again. I also go to an annual party the Saturday after New Year’s where I see many of my friends. My celebrations don’t need to be ruled by the calendar. My holidays aren’t dominated by shopping, either. Years ago, I vowed never to set foot in a mall during the holidays and I’ve stuck to it. I shop local, go to art sales or buy online. I enjoy the holidays so much more. I think traditions are lovely and wonderful, and there are small things I’ll always want to do, like hanging my childhood stocking by the fireplace. But I think sometimes we get so wrapped up in how we think the holidays are supposed to be that we don’t consider how we want them to be. Sure, we all have obligations that can’t be shirked. But if you stop and think about it, there are a lot of “have-tos” that you really don’t have to do. So take a second look at that list, and keep what’s nice and ditch whatever you can that’s not-so-nice. Create your own traditions and revel in them. I can’t imagine a better way to celebrate the people you love. Including yourself. It was a great gathering of women, a powerful reminder of how strong we are and how much we can do. The Women for Obama initiative launched this week, and volunteers from Organizing for America (OFA) — the President’s grassroots team — met in Pontiac, Mich., to listen to a kick-off conference call with Michelle Obama. We made phone calls of our own, too, asking other women to take action and get involved. 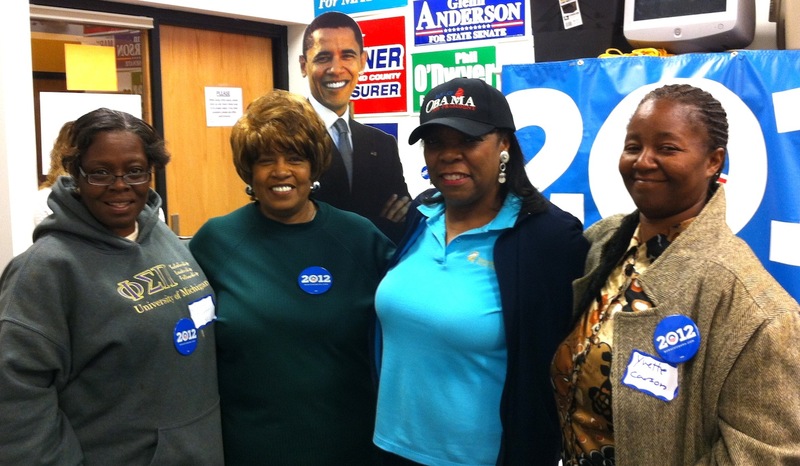 The 20 women who gathered in Pontiac are already actively engaged in the 2012 campaign. Each one has a story about why she supports President Obama. The environment is important to Pam, who believes in the President’s position on clean energy. “I want to give him a second term so he can work more on that,” she said. Glenda and Sylvia both admire the President and First Lady for their commitment to American families. They applaud Mrs. Obama’s leadership role in the Joining Forces and Let’s Move programs. Mrs. Obama thanked all the women listening in on the call for getting involved, reminding us that change happens one person at a time. She asked us to do whatever we can to help the President continue the work he’s doing and protect the progress he’s already made for women and their families. Whether it’s working a phonebank, registering voters, hosting a house party to educate friends and family about the issues or just talking with people one-on-one, women have a vital role to play in the 2012 election. After all, we play a vital role in this country. Mrs. Obama asked us to step up. Everyone who was in Pontiac for that call already has. But we’re women. We’ll step up even more. Because there’s no limit to what we can do. There are plenty of reasons to say no in life. Some of them are much more important than the reason I said no last week. Skipping my first day wasn’t easy. I am not a person who backs out of a commitment, even to myself. Which is why my saying no to this is more important than it might seem. I struggled a bit against letting that first day go by. But once it did, I felt unshackled. I felt lighter. Even more important, the writing I’ve done since has just flowed out of me. I’m inspired, I’m having fun, I’m writing things I feel good about. This is not a new idea. We all know that saying no is a way of expressing our freedom, our independence. It’s a way of asserting ourselves. I’m just not always very good at it. I don’t say no easily. I take on everything that interests me — and everything I’m asked to do — and damn the consequences. But that’s not always a healthy decision for anyone, especially myself. Instead of being forced to write something every day, just for the sake of writing something, I have the luxury of taking my time. I can write the terrible first draft and come back to it later and edit it so it’s not terrible anymore. I can let things incubate. I can polish and play. I can have fun. I can express myself clearly and creatively. It’s not just a writing lesson, though. It’s a life lesson. As I was pondering dropping out of NaBloPoMo, one of my biggest clients called with a rush assignment on a project I’m the exclusive writer on. I said I didn’t think I could pull it off. I didn’t want to overpromise and underdeliver. Could she find another writer to handle one part of the crisis while I helped with another? She agreed that was a good strategy. There’s a time I would have said yes to the entire project. But instead, I found the voice to say no. It was the right thing to say for everyone involved. Can we say no to everything in life? No, and we shouldn’t. Sometimes we say yes because it’s polite, or it’s business, or it’s just the thing to do. Saying yes can also open unexpected doors, even if we’ve been standing there pulling against the doorknob trying to keep it shut. But should we say no to some things? Yes. And I’m getting pretty good at it, if I do say so myself.